My eldest son has returned home from a five week band tour of 26 cities and 30 shows. He zigged across America to New York City in his black van crammed with band members then zagged back to LA and then zoomed up the west coast to Canada. In the pictures I saw on Facebook, he grew a fuzzy beard and appeared to wear the same slowly deteriorating sleeveless t-shirt for several weeks at a time. As I wrote last December, he’s still far from my tree. He’s in between tours, so he’s living in the back of his van, sleeping on a futon mattress shoved between the seats. He’s parked in a friend’s alley, and uses their kitchen and bathroom for a weekly fee. When he was 14 and had a faux-hawk, he used to tease me and say that when he grew up, he wanted to live in a van by the side of the river. I realize now that he wasn’t kidding. I pick him up for our lunch date at a prescribed street corner. I’m happy to see you, I say, as he folds himself into the car. He turns to me and a wide grin spreads across his face, I’m happy to see you too, Mom, he says. He’s relaxed, tanned, and in wiry shape. His little brother Aaron is with us, and he’s greeted with a rousing ‘Hey Goose’ and a high five. (Goose is his pet name for Aaron, as in, Silly Goose). There’s some friendly razzing, arm punching and an impromptu burping contest. Let’s do Indian food, my eldest exclaims and we are off to an all-you-can-eat buffet, where we happily tuck in plates of garlic naan, vegetable pakora, dal and chickpea curry. He and Aaron slurp mango juice and wrestle in the restaurant booth. How was your tour? I ask, not able to fathom a road trip of such epic proportions. He’s 25 years my junior and has been to more American cities and towns that I can ever hope to see in my lifetime. His eyes are brightly shining – it was pretty consistently exciting, he says. Most of us live our lives small, and in fear – all in the name of being comfortable and stable. My son has not taken that route. He lives life large and out loud. He’s worked steadily at a job since he was 15, saving money to buy drum sticks, a dilapidated van (which he can’t even drive since he doesn’t have his license – it is instead the band’s van) and gas money to go on tour. He works to tour. He’s the most ambitious and driven person I know. He is unapologetic about doing what he loves. And he lives free from fear of judgment. I’ve realized that fear of judgment is what keeps the rest of us small. After our lunch, I drop the two brothers at a movie. 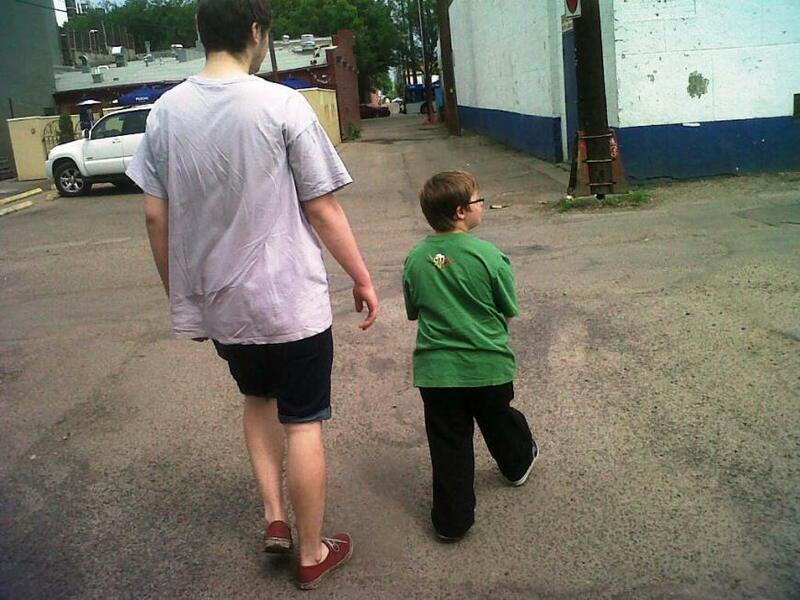 My eldest, 6’2″, ambles beside tiny Aaron. They have a pocketful of change to play video games. My musician son has his arm draped casually across his youngest brother’s shoulder. My tears well up seeing this tender gesture, and afterwards, I sit in the car for a long time. I have one adult son – wild, unencumbered & resistant of authority. My youngest son, born with an extra chromosome, is persistent and full of life. Here I am, a suburban mom, closing in on fifty, and I’m learning life lessons from my young, diverse sons. Here’s what they’ve taught me – they nudge me subtly and gently towards this question: Mom, what would you do if you weren’t afraid?